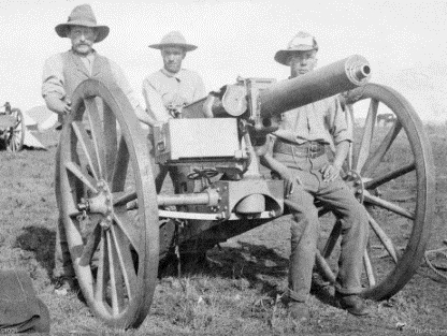 One of the most significant weapons of the Boer war was one that initially seemed to have little going for it. This was the 37 mm one pound Maxim Nordenfeldt or Vickers Maxim. Following the successful introduction from 1885 of the rifle calibre Maxim machine gun, the Maxim Company began to experiment with other options. From this was born the much larger 37 mm gun using the same Maxim action. Maxim hoped to position the weapons for a perceived naval need. The torpedo boat was seen as a potential scourge to battle fleets, small, fast and manoeuvrable, these could dodge the main armament of battleships and launch lethal strikes, thus negating the largest battle fleets. Automatic cannon were seen as a potential answer to the menace. The one pounder had a rate of fire of 60 rounds per minute and a range of 2700 m. Maxim was also marketed as a land-based version in a light support role. Offered to the British Army they were rejected quickly and comprehensively for a range of good and rational reasons which firearms experts would concur with today. • They did not fit British Army doctrine. • The weight of shell was inadequate when compared to the British 15 pounder or 12 pounder shells. • Range of 2700 m was inadequate compared to artillery. • Shrapnel ammunition was seen as prone to a large number of 'blinds' (ones that failed to explode). • At 1370 kg on a carriage it was seen as too heavy for a machine gun and too light and unreliable as an artillery piece. It was judged ineffective and unnecessary. 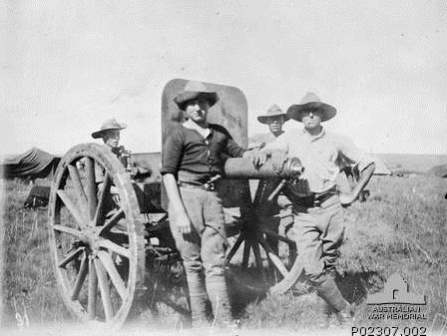 The Transvaal republic however thought differently, not least because they were already concerned at the lack of reliability of the rifle calibre Maxim. It was also seen as a cost-effective way of getting a light support weapon in the hands of each commando if necessary. From the first day of the war the weapon rapidly developed a mystique which rivaled the Japanese 'Zero' of World War II. 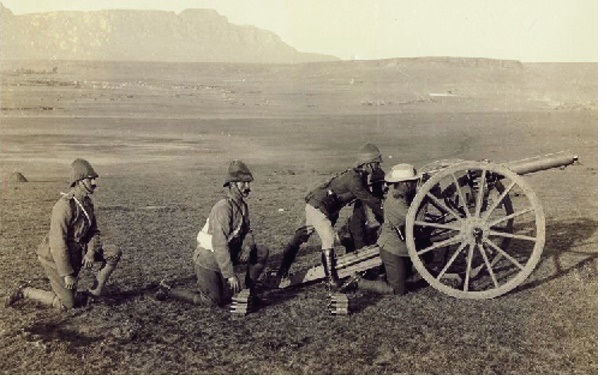 It was ideally suited to the commando style of war, with smokeless powder and opening ranges a lot less than planned for by the British, it was difficult to detect. The British habit of siting gun positions forward, whether that be artillery or machine guns, made them ideal targets. The spread of fire would roughly cover a batteries footprint. So that even as they unlimbered a sudden burst of fire could cause chaos as men and horses fell or tried to bolt. 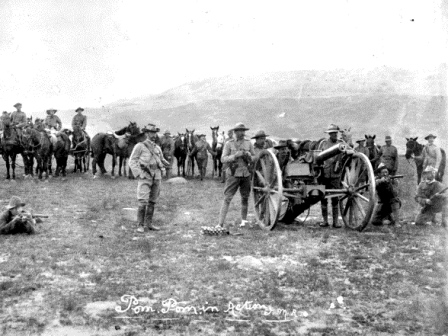 Often the Boers would indulge in "shoot and scoot" missions firing 30 to 50 rounds and then changing position. The weapon had a demoralising effect on British soldiers used to artillery that sounded a whistling noise so they could throw themselves on the ground and stand up immediately afterwards. Now they clawed the ground as the first round went off desperately waiting to see where the next four rounds would go off and hoping it would not be near them. The War Office still refused to supply them however the demands from the field were long and strident and direct intervention by Kitchener ensured that eventually over 50 pom-poms were shipped to British forces in South Africa. They were usually operated by Royal Artillery as a section of guns as part of a Royal Horse Artillery battery but often deployed separately as sections if not individually. Eventually it was usual for each brigade or column to have at least one pom-pom attached. Ammunition generally came in 25 round belts, about 125 or 150 rounds constituting first-line ammunition. Bursts were usually five rounds and ammunition was usually, common shell (that is high explosive) or shrapnel. Although armour piercing was available and there appear to be some examples of armour piecing being fired at armoured trains by the Boers. Given the sound it made with one round per second it became known as the 'pom-pom'. The Boer acquisitions had been made under licence in Germany and Holland and were shipped through France to avoid detection. A total of 22 were acquired by the Transvaal in 1896 and 1899; during the war the Boers captured another seven from British units. 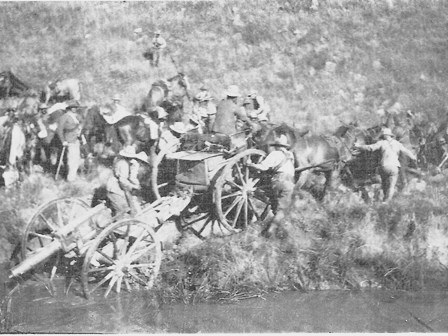 Most were lost to the British by the end of the war but at four were still in Boer hands at the end of the war, although not necessarily operational. On 4 January 1902 Valentin's corps, 5QIB, with one pom-pom was detached as a flank guard to the column on the left flank. On meeting the enemy Valentin withdrew to the nearest ridge, opened fire, driving off the enemy. A short advance brought them to more enemy. This time the Boers attacked in force but Valentin's 300 men were already in position and it is reported that his pom-pom created havoc amongst the attackers. After arrival the 2nd Australian Commonwealth Horse (Victoria, South Australia, Western Australia) began a drive on 7 May 1902. The width of front of the advance was about 2½ km with C Squadron on the left and D Squadron on the right, these two leading squadrons being supported by a pom-pom in the centre of the advance. 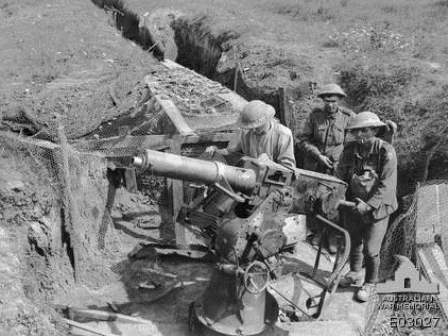 The British Army did not employ it as an infantry weapon in World War I, as its shell was considered too small for use against any objects or fortifications and British doctrine relied on shrapnel fired by QF 13 pounder and 18 pounder field guns as its primary medium range anti-personnel weapon. 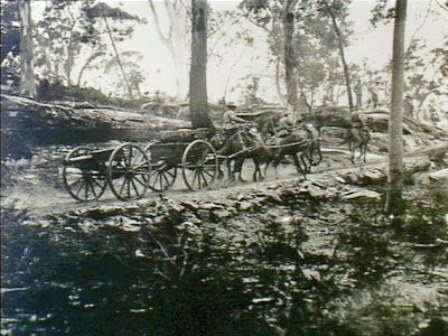 The terrain at Gallipoli would have made it ideal albiet hard to man-handle into position. There AP shells from the Navy could not provide the air bursts to keep an enemy's head down and fire from the field guns was difficult to control in the undulating terrain. In 1903 as part of its post-war reorganisation the British army assigned one pom-pom to each regiment of cavalry. It provided much needed reliable direct support and what's more the units could be equipped from stocks bought for the Boer War, therefore at minimal cost to the taxpayers. Ironically captured Boer weapons were not taken on charge (foreign manufacture therefore dubious!) but handed out to cities and towns around the empire as prizes and as gate guardians. The Royal Navy also decided to equip many of its lighter craft with a pom-pom on a naval mount for close in protection. By 1905 the Australian Army decided to follow suit and all Light Horse Regiments were equipped with a pom-pom so that each Light Horse Brigade could field a section of three when they were brigaded. These were bought new from the manufacturer, 18 in total being acquired – one for each regiment on the order of battle. That meant that some regiments did not receive theirs until 1908. No spares or training equipment were acquired so that training was done by a training team moving around the country to unit and Brigade camps, establishing a school on site to conduct the training. Shoots were usually conducted at a range of about 800 yards. Ironically as all this was taking place the British army declared the pom-pom obsolete in early 1907. The army technocrats had never liked the weapon. "Over our dead body" had been the cry when its introduction was first mooted in the end it was the dead bodies of soldiers in South Africa that caused its introduction. As previously mentioned, too light a shell and too short a range for artillery, while still being quite a weight to drag around, not the same firepower as a machine gun and its cardinal sin in the eyes of a few at the War Office – why have this when you should be able to do your job with swords and lances? By 1907 with the Vickers machine-gun replacing the less reliable maxim, the new 18 pounder on the way to field regiments and the 13 pounder to the Royal Horse Artillery Regiment it was increasingly hard to make a case for the pom-pom. In Australia the Light Horse hung on desperately to its prized asset. In August 1912 it was finally announced that the weapon would be withdrawn and replaced with two maxim machine guns, Australia could not yet afford the Vickers. These were horse packed rather than towed. Despite this the 4th Light Horse Regiment then based in New England and the Hunter with its headquarters at Maitland still took its prized pom-pom to camp at Scone in May 1913 but that appears to be it. The weapon disappears from Light Horse history at that point. It is hard to conceive of it having a support role on the Western front but it would have been interesting to see how a section per Light Horse Brigade might have assisted in Palestine. Yet the pom-pom refused to die so easily. The Royal Navy found that the one pounder was not hard-hitting enough so by degrees increased the size of the shell first 1½ pounds then the two pounds. The two pounder became the main anti-aircraft support weapon on warships until superseded by the Bofors and Oerlikon in World War II. Batteries of up eight barrels were found on most British and Australian warships and some lasted unreplaced into the 1960s. In World War I weapons were dragged out of store often given new mounts and deployed as anti-aircraft weapons both in England and in France. In France the pom-pom is said to have brought down the first German aircraft to be shot down by British forces. It still played a valuable role throughout the war in Europe, both in British and German hands, and in the Middle East often still on the old naval mounts. Just prior to the war the British army experimented with towing a pom-pom behind an armoured car or truck, that the experiment seems to have been short lived. It was the Royal Navy who were very much more serious about armoured vehicles. 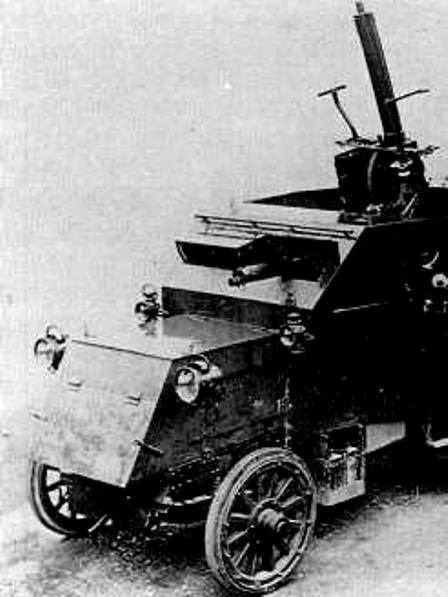 With Locker Lampson establishing the armoured car based on the Rolls-Royce chassis, it was realised that the speed and range might quickly take them outside the support range of other forces, so a pom-pom was installed as a trial on a Rolls-Royce armoured car without its turret probably in 1915. It only had a primitive gun shield but then again no different to the gun shields for .50 cal in Vietnam. 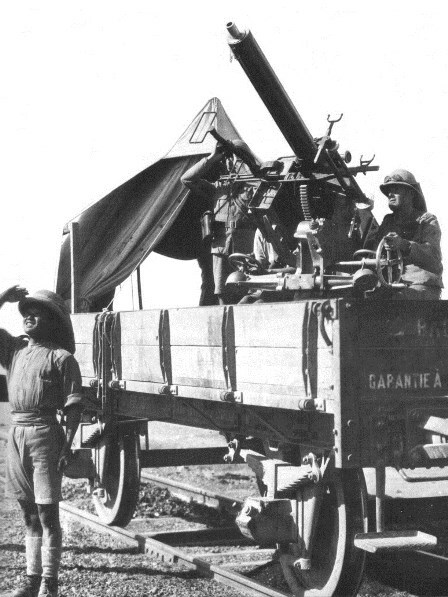 However it was not proceeded with, perhaps because of at this time all armoured cars were transferred to the army. Still an armoured car with a pom-pom and a top speed of 60 mph would have been an interesting asset in the desert.